Red, navy blue and silver combine with an image of a silver and ruby necklace in this victorian-inspired Quinceanera thank you card. 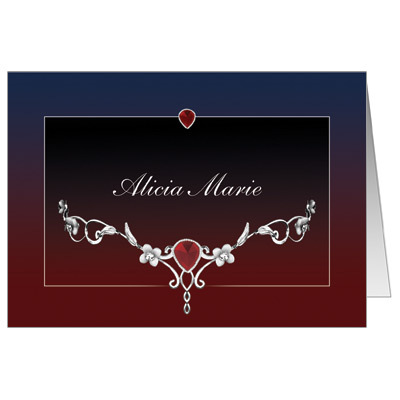 With colors that are reminiscent of twilight, this card is perfect for a midnight garden or even vampire themed party. Your child's name is printed in script for added elegance. Folded card measures 5x3.5.